For anybody who uses filters, be they for protection (e.g. UV or clear) or for effect (e.g. a circular polarizer or a neutral density) the overall objectives for the filter are the same; don’t degrade the image quality any more than absolutely necessary to achieve the intended purpose. Of course, glass is glass; it’s not perfect. Moreover, any air-glass interface has all the normal problems that come with a change in refractive index, refraction, dispersion, and reflections. No filter, or lens, maker can completely remove all possibility of aberrations and reflections, but they can do their best to minimize them. So let me put this out there right away. Filters are one place where there’s clearly more than one way to skin a cat, and manufacturers love to throw out all kinds of big words and technical designations and don’t provide a whole lot of explanation of why that particular thing is important. As a photographer, sometimes I think the point of this is to dazzle us with nonsense to make things seem more different than they actually are. Does the filter affect my images negatively? Does the filter provide a value to me comparable to the cost (or the premium over another product that does the same thing)? So while Breakthrough Photography advertises their filter as being made with Schott Superwhite B270® optical glass and having their proprietary Nanotec® coatings. I don’t really care; either it works well or it doesn’t, and that’s what I’m going to try to find out here as best as I can. I’ll be upfront here and say it feels a bit weird talking about build quality for a filter. Honestly, there’s not much to it, a metal ring of some sort and some glass that does something. Well more or less. 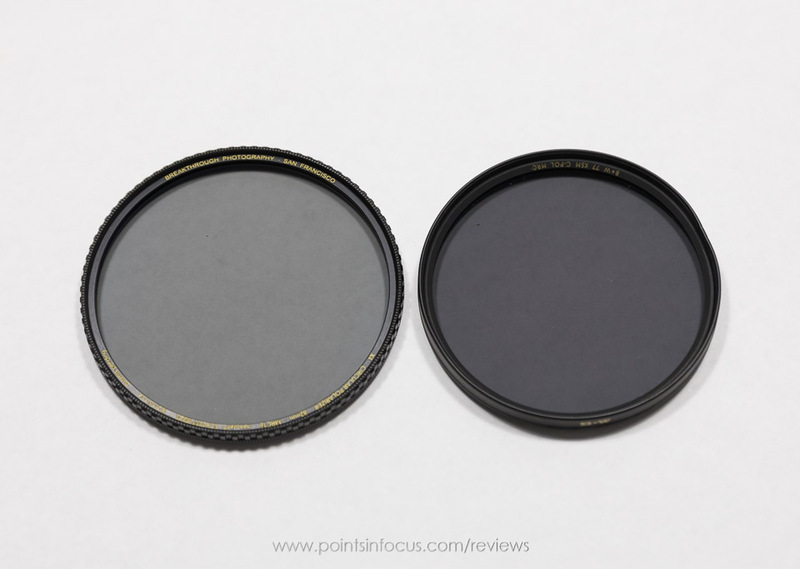 The Breakthrough X4 CPL’s filter ring is made of brass, like most good filters are. Aluminum, while cheaper and lighter, isn’t as thermally stable and as a result is more prone to sticking in other filters or the threads on the lens. A stuck filter isn’t a recipe for a fun time. Breakthrough Photography also claims that the X4 CPL is weather-sealed. If we were talking about a solid ND filter or a protective filter I wouldn’t even comment on this, it’s just not a big deal. I’ve done some testing in the past, where I screwed to clear filters together and submerged them, and the cavity between them remained dry. However, this is a circular polarizer, in order to be useful one has to be able to rotate it, and that rotation action is certainly a place where water can leak thorough that doesn’t exist in a normal non-moving filter. Unfortunately, I don’t have a good way to test the limits of the X4’s weather-sealing — and honestly, I don’t really want to either. That said, the fit between the rotating polarizer part of the filter and the fixed rear thread is smooth but quite stiff, especially compared to the almost free-wheeling loose fit on my B+W. There very clearly is either a much tighter tolerance or some kind of sealing material between the two parts of the ring. The big thing for me, though, is the texture of the rotating ring. My B+W’s ring is virtually smooth, aside from a very fine very short linear knurling around the very front of the ring. Breakthrough Photograph’s X4 CPL has a much coarser, and as a result much easier to grip, raised grip pattern. Bare handed, I find it very easy to know when I’m holding the rotating part of the filter only, or both parts together. On top of that, and maybe even more importantly, I find it very easy to know when I’m at the filter by feel and not just the end of the lens. The texture of the ring is doubly important in some respects, as this is a thin filter at only 7.5 mm total thickness. One level of testing I’ve been adding recently to my handling tests is testing gear with gloves on. My “lightweight” gloves are a pair of Freehands Stretch gloves, my medium weight test is with a pair of Marmot Precip gloves, and for heavy weight I use the Marmot Precip gloves with a pair of liners on under them. With the Freehands gloves on, the texture of the X4’s ring is still easily discernible by feel. Both the X4 and B+W were easily manipulated, though tactile response was much better on the Breakthrough X4 CPL. Stepping up to the Marmot Precip gloves, the gloves are now thick enough to remove any tactile feedback from the courser Breakthrough X4 ring. However, the deep texture can still be felt when dragging the glove along the surface. Both the Breakthrough X4 and the B+W could still be manipulated easily though. Adding a liner to the Precip gloves removed what little feedback there was from the texture of the X4’s ring. In this case I couldn’t even feel the ridges when dragging my finger across the filter either. Again, both filters could be manipulated with the gloves on. One thing, however, really stood out in the glove testing. The amount of drag, or resistance to rotation, in the Breakthrough X4’s rotating mount was a very solid indication that I wasn’t unscrewing the filter while turning it. With my B+W, the filter rotates (and sounds honestly) not all that much differently than screwing into a lens or filter feels. That makes it very hard to know, especially if you can’t feel what you’re doing, if you’re unscrewing the B+W as you rotate it to the desired angle. Taking that over to the Breakthrough X4, I found the difference in drag between rotating and unscrewing to be especially comforting when I couldn’t otherwise feel what I was doing though gloves. Just like a lens, a filter, as an air-glass interface, creates surfaces for reflections and thus flare to occur on. Moreover, since the filter is something that will be handled and is generally exposed to the elements at the front of the lens, the filter also has to be able to handle dirt, oil, and water on it’s surface as well. The answer to both fo these problems are coatings — in much the same way camera lenses themselves are coated. By my reading and understanding Breakthrough Photography coats their filters with two different coatings, similar to what many lens makers are now doing. The outer layer is a hydro- and oleo-phobic coating Breakthrough Photography calls Nanotec®. (Does everything have to be nano these days?) In principal, at least by my understanding, this is similar in purpose to the fluorine coating that Canon is now putting on their front and rear elements. It prevents oil and water from sticking to the filter and as a result makes it easier to keep clean. In terms of keeping oil off the filter, the coating seems to work very well. One of the biggest problems, in my experience, with a CPL filter is that you’re constantly either adjusting it or removing it. All this handling inevitably results in me missing the ring and smushing my finger into the filter. With other filters, even my B+Ws, this inevitably results in a pretty distinct finger print that sometimes isn’t so keen on coming off. With the Breakthrough X4, the smudge seems to be much much smaller (less oil from my finger transferred) and wipes off completely with a very gentle whip of a clean microfiber cloth. As far as the hydrophobic nature of the coating; well it’s there and it appears to work. As for a more scientific analysis of how well it works, I can’t really offer that. The second part of the coating system is for the optical benefit of the filter. This is the MRC or multi-resistant coating. This coating is designed to reduce reflections which lead to flare and contrast loss. As far as testing the effectiveness of the MRC coating, again I run into a limitation with my ability to test optical systems. Moreover, I can’t do a straight comparative test due to not currently having a way to mount the 82mm X4 on any of my smaller lenses — I know, more excuses. At this point I think it’s time to take a bit more in-depth look at the optical performance aspects of this filter. Unfortunately, I don’t have an optical test bench and a spectrometer and so forth, so these tests are going to be comparable crude by scientific or engineering standards. That said, by photographic standards I think things will be good enough; if there are no glaring issues in my tests, it’s unlikely that there will be issues in actual pictures. One thing I do want to point out. In this part of the testing, I’m going to be comparing the Breakthrough X4 CPL to a B+W Kaesemann CPL. It’s not a new B+W, and it’s not part of their newer high transmission line. In fact, my B+W CPL is more than 7 years old. I think it’s important to point this out because the B+W I’m using is not an accurate representation of current B+W CPLs. I’m using this B+W filter because it’s the only other CPL I own, and for no other reason. Moreover, for me, part of this process is understanding the differences between the two filters I have an use. Breakthrough Photography makes the claim that the X4 is the sharpest CPL on the market. Unfortunately, at the time I’m writing this article, I don’t have a suitable way to evaluate this claim. I would like to, and almost certainly will, return to this point in the future when I have a more suitable test bench setup that I can use to make MTF measurements. Until then, however, I’m leaving this here as a placeholder and as a note that I haven’t yet tested the sharpness of this filter. That said, in a very non-scientific way, at least on my 30 MP Canon EOS 5D mark IV, I can’t see a loss in sharpness images I’ve made with and without the X4 on the camera. That of course, doesn’t mean that its not happening, just that what losses there are, are either smaller than my camera can resolve or dwarfed by other factors in the real world. 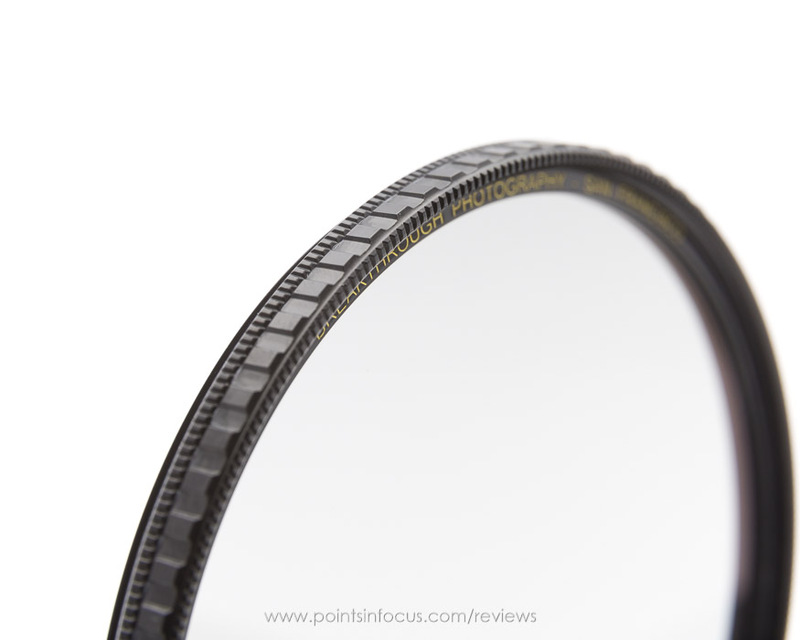 Light loss is always a consideration when dealing with circular polarizers. Many old ones would eat two stops or more of light, modern ones claim to be closer to 1 stop. Breakthrough Photography’s X4 CPL next to an older B+W on a sheet of white paper. Whether you want light loss or not is going to depend on the situation and the photographer. With a circular polarizer, my personal preference is for as little light loss as possible. This keeps my shutter speeds as high as possible, which I find desirable as I’ll occasionally use my CPL when shooting wildlife to reduce the glare no leaves. If I need to get something darker, I can always add ND to the equation, but I can’t remove it. My test for light loss wasn’t overly scientific or especially accurate. I simply held the filter in front of a lens that it completely covered (in this case a Canon EF 50mm f/1.8 STM) and metered a white sheet of paper on my desk. Oddly Breakthrough Photography doesn’t make a claim to the minimum light loss on their marketing for the X4 CPL. I can kind of understand why, given that the exact exposure change is going to vary depending on the orientation of the polarizer relative to the scene. That said, the X4 CPL is by far the lightest, or most transmissive, CPL I’ve seen — though admittedly it’s not like I go around looking through CPLs. Admittedly this test is somewhat crude. My camera doesn’t behave in less than 1/3 of a stop, so it’s entirely possible that the B+W did a little better or the Breakthrough X4 did a little worse. That said, overall the difference is big enough that you don’t need to split hairs to see it. Put the two filters side by side on a white surface, and the X4 is noticeably lighter. Put them on a camera, and the X4’s shutter speeds are higher. That said, to be fare to B+W again, their CPLs are now high transmission that they claim are between 1 and 1.5 stops. Mine is not one of these. Again, I’m doing a crude — but I think functional in so far as photographers should be concerned — test of color rendition here. I don’t have a spectrometer and full spectrum lights, so that’s out. What I do have, though, is an X-Rite Color Check passport and a camera. 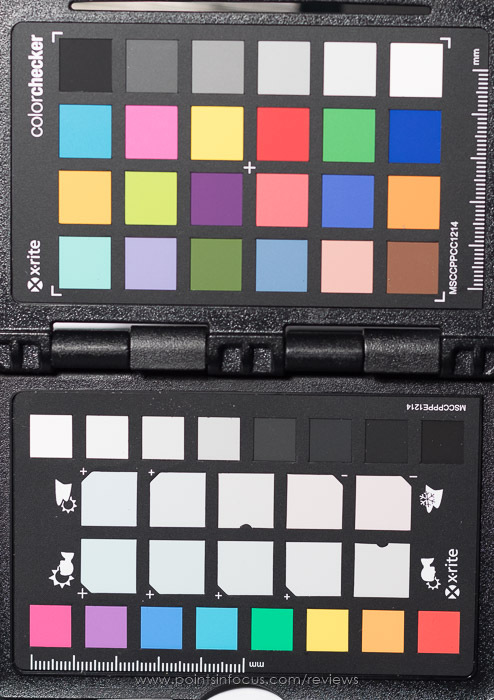 The images were shot, using the exposure differences that were determined in the previous section, and brought into Lightroom where a custom white balance was set based on the second lightest neutral gray patch on the card. 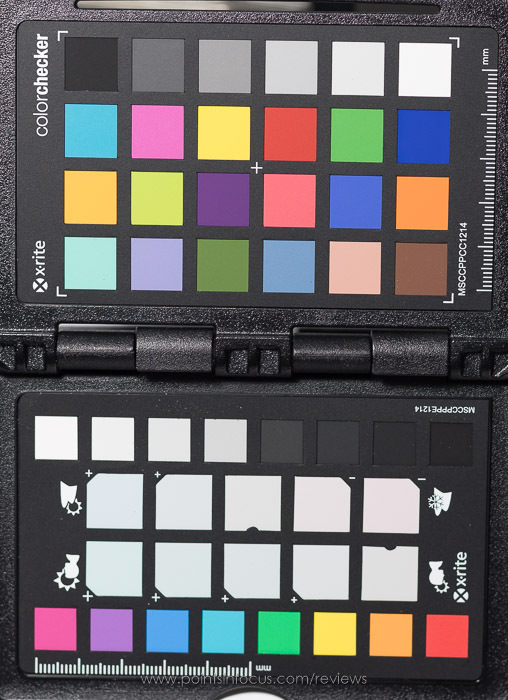 Since the lighting light source didn’t change, a change in balanced color temperature should be entirely the result of the filter altering the color of the light. In this limited test, the Breakthrough Photography filter balanced identically to the unfiltered exposure. Meaning at least in the broad strokes the X4 exhibited no color cast at all. Compare this to the B+W CPL which rendered 100 Kelvin bluer and 6 points more green. In some respects this is a bit of splitting hairs again. A 100 Kelvin and 6 point magent/green difference in color is not something that’s going to be noticeable to most, if not the vast majority of, people. Moreover, it’s a small shift that the B+W’s color cast can be corrected in post. That said, if the filter doesn’t alter the colors compared to a regular lens, all the better. However, there is one big caveat to this, and that’s the point of this second test. 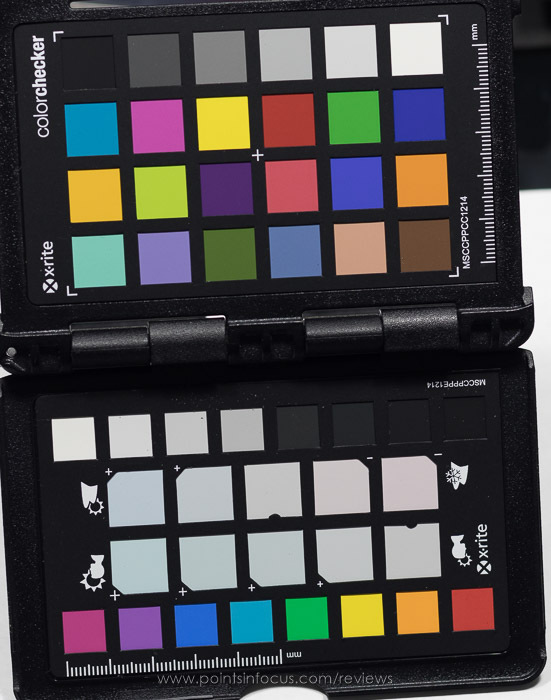 Breakthrough Photography’s published spectral response curves for the X4 shows the biggest difference between it and the tested B+W, Hoya, and Tiffen CPLs is the response to red and infrared light. Where virtually every other CPL’s transmissivity increases starting at around 600 nm and spikes up sharply around 650 nm. 600 nm to 740nm is the range we describe as red light, and beyond 740nm we’re talking about infrared light. Because of the appreciable differences in spectral response to red light, and the general LED’s general lack of spectral power in the red and near-infrared spectra, this test was repeated a second time with a more red heavy incandescent source under similar conditions. Finally since I had the lights out, I thought I’ run the test one final time using a photo grade CLF. In this case a 50W Westcott lamp for their spider light series. Admittedly, the one source I haven’t tested under, at least yet, is the sun. At the time of writing this, it’s been pouring rain continuously and isn’t expected to let up anytime soon. I fully intend to revisit this when I have the time and opportunity to test under actual daylight conditions. That said, is the Breakthrough Photography the most color neutral CPL? For that matter, does it even really matter? To start with, these crude numbers do seem to confirm Breakthrough Photography’s spectral data. They claim the X4 attenuates more red light than the competition. This should certainly show up as needing more magenta to balance to neutral than green, and generally we see this is the case (when it doesn’t balance out perfectly to start with). As far as the blue/amber (color temp) axis goes, here too the X4 does very well. In 2 out of the 3 tests, the color balance was only off from the unfiltered lens by a measly 50 kelvin. Again, pretty good results. Plus in every test, it was markedly closer to the unfiltered lens than the B+W. The more important question is does this all matter? At best that seems like a big maybe, bordering on a no. If you’re shooting film, then it very well may matter. 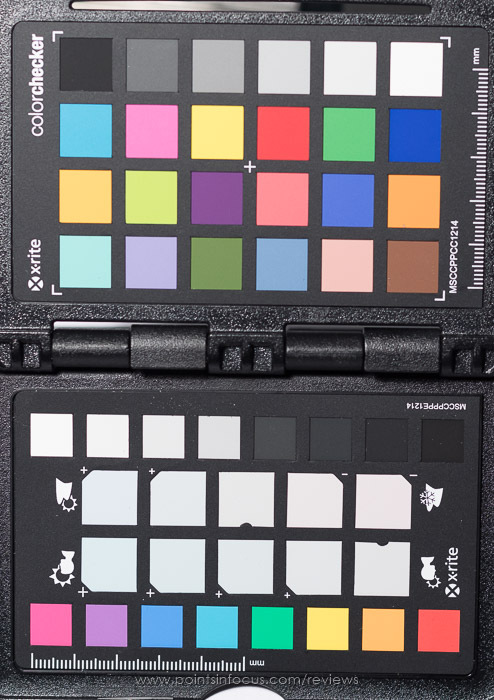 Color balance is baked into the film, and anything that isn’t neutral or close to it, is going to render improperly. The Breakthrough X4 CPL seems to be more neutral in some respects than the B+W, but I’m not sure that either are so far away from being neutral that it’s going to meaningfully matter. For digital shooters, we can correct the color balance in post processing. However, this isn’t a free ticket to using a filter with a strong cast. As I’ve shown in the past, when looking at high density ND filters, too much of a cast can be entirely unfixable. Again, while the Breakthrough X4 CPL does seem to be slightly closer to unfiltered than the B+W, both are very much neutral enough that for me. I’m not going to split hairs over the differences. This is the part where I’m traditionally supposed to render a verdict on whether or not the bit of kit I’m talking about is any good and if you should buy it. On one hand, that’s a question I can’t really answer. It’s not that I can’t recommend the X4 CPL; I can. And it’s not that it’s not a good product; it is. The problem is that this is always is a question of value for money. More importantly, it’s a question of what’s the best value for your money. And that’s where I simply can’t say what anyone else should do. Was the X4 CPL a good value for my money? I’m confident at this point that for me the answer to that question is that it is. The better tactile feel of the ring is worth the costs over the B+W I otherwise would have purchased. Maybe the best way to sum this up is with this, after having used the Breakthrough X4 CPL even just for initial testing, I have a hard time wanting to go back to using my old B+W. Update 2017-01-06: After having seriously reviewed the issues I had with my old B+W 77mm CPL while shooting in Alaska, I decided to replace it with a second Breakthrough Photography X4. So that makes 2 of these that I’ve bought on my own dollar which I think is a pretty good indicator of my position on their performance.